Lookonline.com is the longest running online fashion publication in the world. Before there was Vogue.com, Hypermode.com, FashionInternet.com, NYstyle.com, Fashionmall.com, Elle.com, Hairnet.com, Hintmag.com and even Fashion.net, there was us. We have not always garnered the attention, funding or the notoriety of other fashion sites, but those in our industry who have followed Lookonline's development over the years, know we helped pioneer the use of the Internet in providing real-time coverage of fashion events, regularly scheduled video reports, fashion blogging (DFR: Daily Fashion Report has been in blog format for almost 9 years and is recognized as the first fashion blog), market reports, editorial cartoons and original runway and event photography long before there were sites like Style.com or Fashionweekdaily. Our site currently has 2,794 subscribers. Most of who come from magazines and newspapers. Our readership garners the most informed members of the fashion press from such publications as Vogue, The New Yorker, Vanity Fair, Harper's Bazaar, Elle, People Magazine, InStyle Magazine, The New York Times, LA Times and The Daily Beast among many others. Other subscribers include fashion directors, publicists and educators as well as students and others who have a real interest in NY fashion. Since our official launch was on December 1, 1994 as a BBS dial-up service (does anyone remember what a BBS service was? ), the Lookonline has been online "officially" for 18 years. However, we were already a BBS service by subscription in early 1993 (our first subscriber was Harper's Bazaar), and it was not until December of 1994 did we began publishing a website (hosted first under another domain name) in addition to our BBS site. Then, in early 1995, we discontinued our BBS service and concentrated on developing our website using our own domain name 'lookonline.com'. 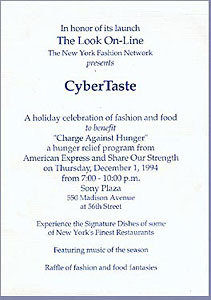 For the record, our official launch was as a party/benefit called "CyberTaste" for the "Charge Against Hunger" program from American Express and Share Our Strength on December 1, 1994 (see above copy of invitation) The event was held at Sony Plaza at 550 Madison Avenue in New York. Over 850 members of the public and a small group of press (WWD did not show up) attended the opening that featured 13 chefs from top New York restaurants serving their signature dishes; a designer auction, wine tasting, desserts, and a live 20 man jazz orchestra. According to officials at Sony, it was one of the largest, if not the largest event ever held to that day at the Sony Plaza's Atrium. (Rhonda Erb put the whole event together for us). Major sponsors for the event included American Express, Food & Wine Magazine, Tourneau, Romana Sambuca, Coca Cola Bottling Company of NY, Georgette Klinger, Colorite, and Sony Plaza. I want to personally thank (again) our many contributors who, over the past 18 years, helped support our site. First and foremost my editor-in-chief, Marilyn Kirschner, whose fashion expertise, wit and determination has set the tone for our editorial coverage; senior editor Bernadine Morris, who lent her name, expertise and a guiding hand for many years. Also special mention goes to Randy Brooke, an exceptional photographer who was always there when we needed him; Diane Clehane for providing us with first class coverage of major fashion and entertainment events, and Rhonda Erb for special reports and her wonderful shopping column Better Bets. Also special thanks goes to Susan Sommers for her timely suggestions; Adrienne Weinfield-Berg, L:ieba Nesis and Stacy Lomman for their special reporting; Isabelle Erb and Muriel Geny-Triffaut for their contributions, and finally a real thank you to Grace Mirabella for hosting our first three 'Master of Fashion' video interviews'. Of course a special thanks goes to my wonderful wife Deborah Brumfield, without whose constant support and encouragement nothing would be possible.